Motives hint at musical ideas. Phrases are complete music ideas. A motive gets things started but never finishes the job. Phrases are in and of themselves. They can stand alone without any further help from any source. It helps to think of a motive as a suggested direction, a question, an unfinished comment. A phrase is then THE direction, the answer, or the completed comment. A phrase takes command of the idea established by a motive. Give a motive to two different composers and the likelihood is that they will generate at least four, and probably many more, unique phrases. More importantly, each composer will create different phrases. Turning a motive into a phrase can be done simply by intuition. If you hear a motive,it's likely that you have a concrete idea of what notes are best suited to turn it into a phrase. That intuition is developed by analytical listening to music. Poets have an inventory of words in their heads. In just the same way composers must build an inventory of musical phrases in their heads. 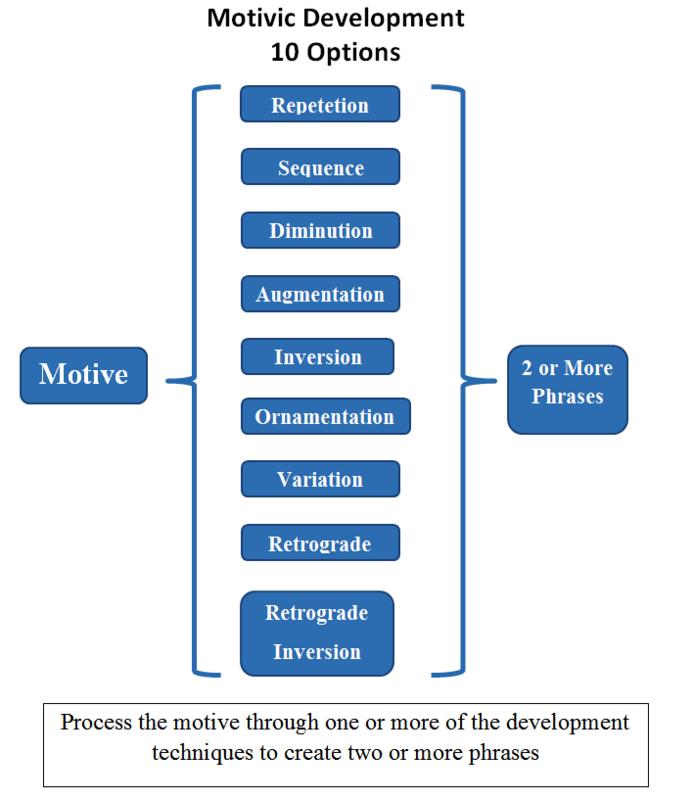 The process of turning motives into phrases is called motivic development. The goal of motivic development is to create two or more phrases that will become a finished melody. We'll explore ten options for motivic development.